I used two DCWV stacks to create this, the Citrus stack and Lemon Flower, a couple of Spellbinders Nestabilities, a cross stamp in my stash, some seam binding that I dyed using Distress Stain in "Cut Grass" and of course most importantly the scripture digi Luke 24:5-6. I pray your Easter will be filled with joy as you consider the death and Resurection of The Lord Jesus Christ. Truely his act of love by dying on the cross for our sins and rising from the dead is the sacrifice and miracle that he performed out of His great love for us all so that we can one day experience eternity in Heaven with Him, if only we believe. Thanks for playing our CAS challenge at 4 Crafty Chicks, awesome! Very nice card. Love the sorbet colors and the layering you added to the sentiment. Thank you for visiting our community and stopping by to play with us at 613 Avenue Create. This is gorgeous, Adrienne. 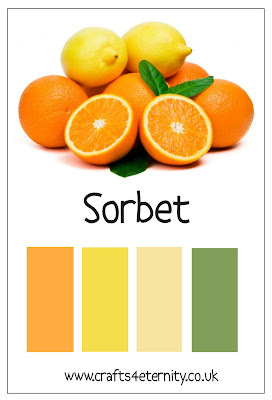 I love the sorbet colors, and am SO happy to have you share it in our challenge this week. 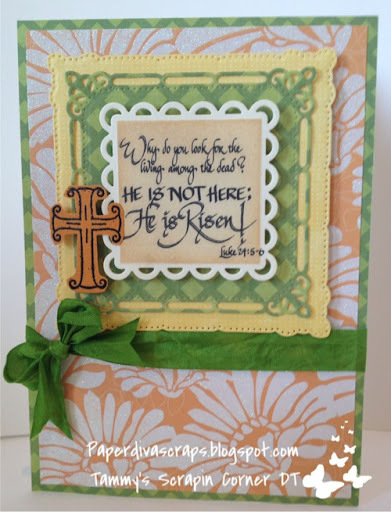 Beautiful Easter card and I love your color combo. Thanks for joining us at Pattie's Creations this week. Sweet card with a lovely sentiment and DP. Thanks for joining us this week at WAW. A lovely card. Such lovely colours and papers used. Thanks for sharing with us at Hobbycutz and good luck. I am loving your card. So warm and cheery with a great message. Thanks for blessing us this week with your project at Word Art Wednesday. Have an awesome day. love the scripture sentiment! Great layout too. Thank you so much for sharing your fantabulous inspiration with us at 4 Crafty Chicks. I really like the color scheme and the way you placed the die cuts; a gorgeous creation. It's nice to see you again at Lady Anne's Stamp Challenge and wish you good luck with the draw. Beautiful card, Thanks for joining us for Lady Anne's Stamp Challenge. This is really pretty. I love the dies you used. I always forget to use mine. Great sentiment. A very beautiful Easter Card - lovely use of die cuts too! Thanks so much for joining us this week at the Pile it On Challenge. Very pretty colors and layers. Thanks for joining us at Pause Dream Enjoy Challenge. Beautiful Easter card in lovely "spring" colours. Thank you for joining us at Hobbycutz “Easter/Easter Box” Challenge and we hope to see you again. Such a beautiful and inspirational card. Thanks for joining us at Scrap It Girl March challenge. Looking forward to seeing you again. I love the spring colors on this card! Thanks for playing at Scrap It Girl! Beautiful card! Thanks for playing along at Scrap It Girl. Beautiful! Thanks for playing along with Scrap It Girl! Beautiful card, thanks for joining in at Scrap It Girl. Such a lovely card. Love the color combo. Thanks for joining us at Scrap It Girl! I'm impressed by your ability to organize all those challenge entries~ it's a lovely card. Thanks for taking the Scrap It Girl challenge.